With O.J. Simpson Parole, A New Round Of Obsession Begins The athlete, celebrity and murder suspect was the focus of an intensely covered trial, and two recent TV series that set him at the center of America's diciest topics: race, wealth, justice and fame. Former NFL football star O.J. Simpson enters for his parole hearing Thursday at the Lovelock Correctional Center in Lovelock, Nev. The panel decided Simpson could be released as early as October after serving 9 years in prison. What to feel, now that we know O.J. Simpson soon will be a free man? That was the question, as cameras focused on a gray-haired, still-charming Orenthal James Simpson, near tears as he thanked members of a Nevada parole board Thursday afternoon. The board told him he could leave Lovelock Correctional Center as soon as this fall after serving nine years. Simpson was convicted of breaking into a Las Vegas hotel room in 2007. Inside were a couple of sports memorabilia dealers who O.J. said had items belonging to him. Two of the men accompanying O.J. had guns, so the former NFL star was found guilty of charges including armed robbery, kidnapping and assault with a deadly weapon. That's what Thursday's parole hearing was about, but this was O.J. Simpson, so the public's feelings likely involve another crime: The 1994 murders of his ex-wife, Nicole Brown Simpson, and her friend Ron Goldman in Los Angeles. Simpson was acquitted of that crime 16 months later, but many people still believe he committed it. One of them is Jeffrey Toobin, who wrote a book detailing his belief that Simpson killed Brown and Goldman. The CNN legal analyst spent much of his time on the channel's coverage Thursday fuming about Simpson's statements to the board about his trouble-free life and his claims of being a "straight shooter." On broadcast TV, NBC anchor Lester Holt and ABC's George Stephanopoulos both wondered if Simpson was trying to re-argue his innocence in the robbery case. Across social media, some expressed dismay at his parole, others showed a sad resignation, and some — including comic W. Kamau Bell — joked about the racial divide the news might expose. Simpson was a model prisoner and served nine years, which should have been enough punishment for the crime he committed — but some people seemed to view his Nevada conviction as a proxy punishment for that other crime. To them, nine years wasn't nearly enough. My feelings about Simpson's parole were simpler: Now, I thought, the media firestorm is really going to begin. 'O.J. : Made In America' Is About America, Not O.J. Every major news outlet around likely is chasing Simpson for an interview. The parole hearing was broadcast everywhere from ESPN to BBC World. Nervous parole board members — one of them drew laughs after mistakenly saying Simpson was 90 years old instead of 70 — plowed through their procedures to deliver the verdict everyone expected. The hearing spawned at least three different trending topics on Twitter on Thursday. The cable channel A&E took advantage of the attention to announce production of a new documentary on the crime which led to Simpson's prison sentence. That's due to air in October — the earliest month O.J. can leave prison. Even with all those acts, Thursday's hearing felt like a pale imitation of the circus that was Simpson's murder trial, the first to draw wall-to-wall TV coverage in the 1990s. But it's still clear: One reason we cared then and now is television. Last year, the FX anthology series The People v. O.J. 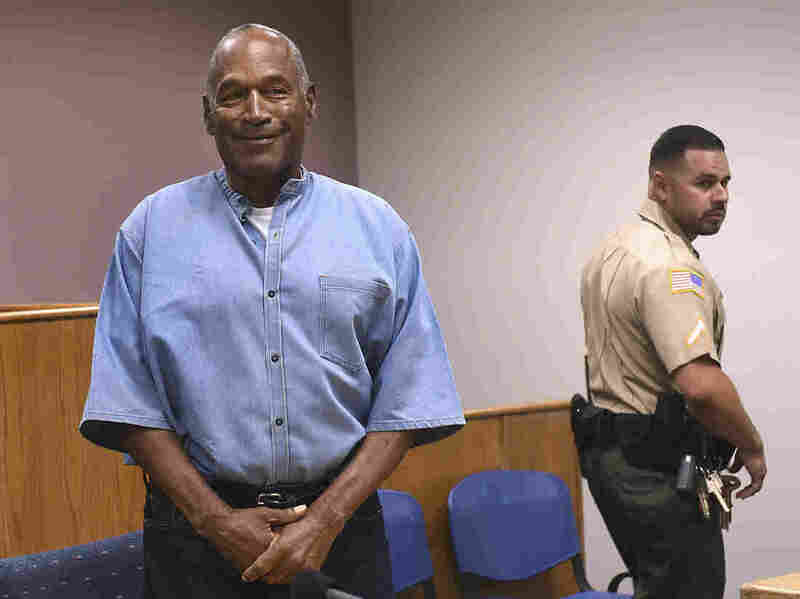 Simpson: American Crime Story and ESPN's O.J. : Made in America made for groundbreaking television by positioning Simpson's rise and fall at the center of the hottest of hot-button issues in America: race, wealth, criminal justice, spousal abuse, interracial relationships and the corrosive nature of celebrity. Murder defendant O.J. 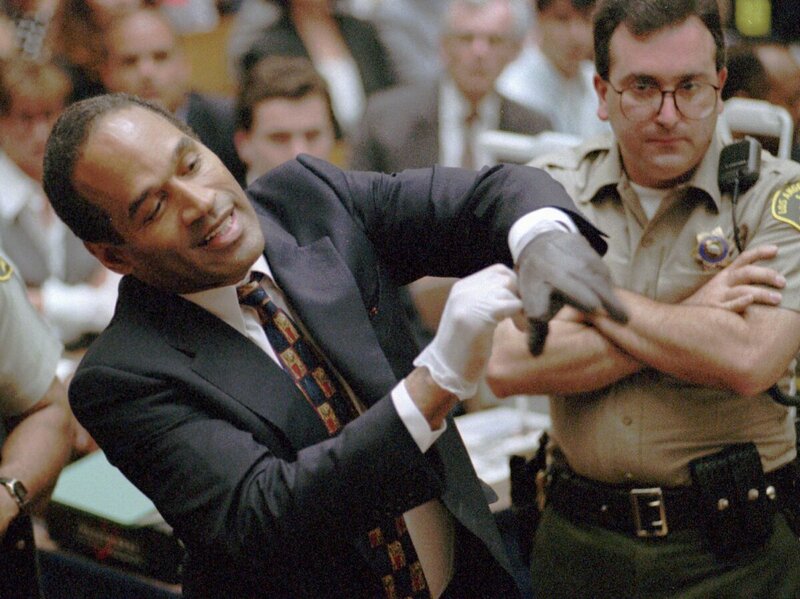 Simpson grimaces in July 1995 as he tries on one of the leather gloves prosecutors say he wore the night his ex-wife Nicole Brown Simpson and Ron Goldman were murdered. The trial transfixed the nation with a tale of a football hero turned accused murderer. Those shows made the case, in starkly different ways, that we could learn about all these subjects by reflecting them in Simpson's story. 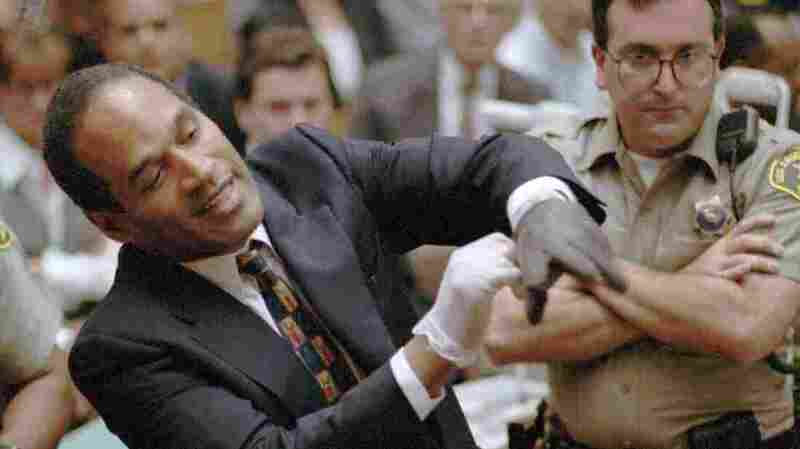 American Crime Story showed how a criminal justice system compromised by its inability to convict white police officers for brutalizing motorist Rodney King found the tables turned when a black man of Simpson's wealth and celebrity was on trial. 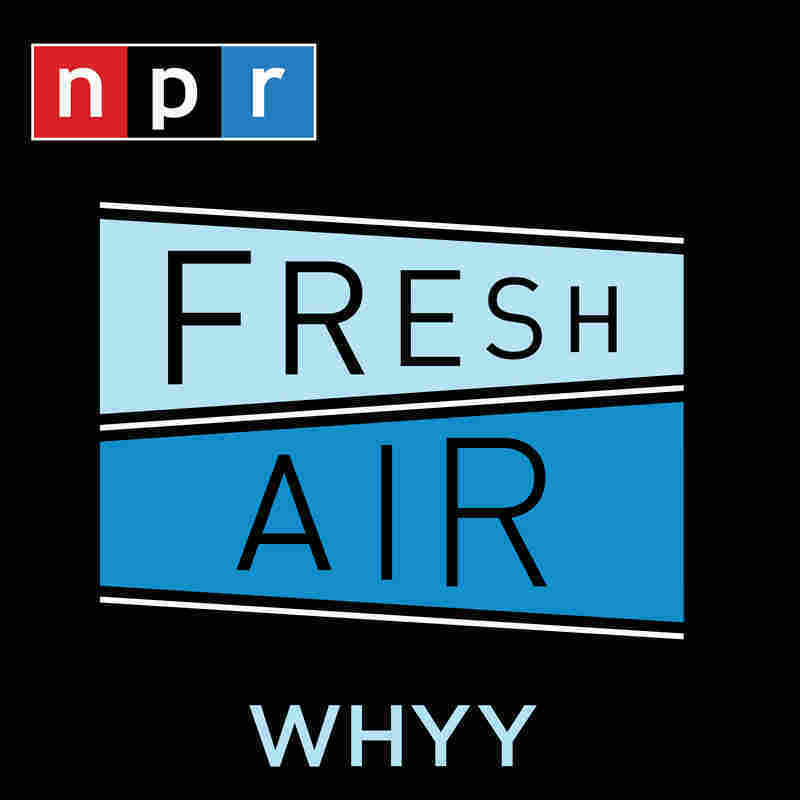 Made in America included an interview with a juror from the murder trial, who said Simpson's acquittal was payback for King's treatment (though another juror disputed that). Those shows both lacked Simpson himself, in the present day, talking about his story, which is why the starting gun has fired on attempts to get Simpson on camera talking about his legacy. Eventually, O.J. will be inflicted on us again. What was obvious from his testimony during Thursday's parole hearing is that Simpson hasn't really accepted how he has contributed to his own problems — even after nine years in prison. It took a long while for him to say the words "I'm sorry" to the parole board. He talked about missing time with his family, and about his religious faith, insisting that "I've basically spent a conflict-free life." Of course, that excludes a few inconvenient facts, including that he beat then-wife Nicole Brown Simpson so badly in 1989 she needed to be hospitalized, leading him to plead no contest to spousal battery charges months later. And it ignores the way he tried to avoid arrest for her murder by fleeing in a low-speed car chase, sitting in the back of that infamous white Ford Bronco driven by buddy Al Cowlings. It feels as if Simpson is the thorn America will never quite extract from its side — living proof of our tangled, twisted struggle with celebrity, wealth, big media, criminal justice, and race. Just when we think we've put it all in perspective, he pops up against to remind of how far we haven't come. No wonder we're all still having a hard time processing it.